Tesqopa (Tel Eskof or Tel Skuf) (Syriac: ܬܠܐ ܙܩܝܦܐ; Arabic: تللسقف‎) is an historically Assyrian town in northern Iraq with a population of 11,000 most of whose inhabitants are Assyrians belonging to the Chaldean Catholic Church. 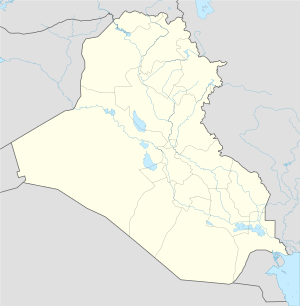 It is located in northern Iraq located approximately 19 miles (about 28 kilometres) north of Mosul. The name Tesqopa is of Syriac origin "Tilla Zqeepa" meaning the "Standing Hill" in reference to the hill next to it that contains the ruins of an ancient town. The people of Tesqopa are called Tisqopnaye [tis-kohp-na-ey] (singular: Tisqopnaya) (Syriac: ܬܣܩܘܦܢܝܐ) (Arabic: تللسقوفي‎). Tesqopa is not mentioned in Thomas of Marga's Book of Governors (c.840) or any of the other early monastic histories of the Church of the East, and may well have been founded as late as the Seljuq period, perhaps in the eleventh century. It is first mentioned as an Assyrian Christian village in a thirteenth-century poem by the Assyrian writer Giwargis Warda. This poem describes its sack by a raiding band of Mongols in November 1235 and the destruction of its church of Mar Yaʿqob the Recluse. Tesqopa was subject to many attacks by the Mongol barbarians, the worst among them was the massacre of 1436 when they attacked the town, killing thousands of its Assyrian inhabitants and burning its crops and churches, ultimately forcing the rest of the inhabitants to flee to the mountains. In 1508 Tesqopa was attacked again by the Mongols, just as they attacked Tel Keppe, Alqosh and the Monastery of Rabban Hormizd. Tesqopa was also attacked by the army of Nader Shah in 1743 during his march on Mosul. The modern day Tesqopa has become modernized in everything. There are coffee shops, restaurants, motels, markets, auto repair shops, jewelry shops, and many other things that did not exist before. Sargis Aghajan built 55 new model houses in 2007 because of the growth of the town. He funded newly constructed pavement of the street leading to Tesqopa High School for boys. He also funded for building a room for the power supply generator for the compound with its annexes. The town received many Assyrian refugees from Baghdad and Mosul in the wake of the sectarian violence in the 2000s. In 23 April 2007 a car bomb that targeted the village resulted in more than 25 deaths. In early August 2014, Islamic State of Iraq and Syria (ISIS), or Islamic State(IS), entered Tesqopa. But on 17 August 2014 the Kurdish Peshmerga retook Tesqopa. After this, the local Assyrians were then able to restore the crosses atop their vandalized churches. Currently the town has no residents, with only Peshmerga in the town, as the town is only 10 minutes from the ISIS line. The people of Tesqopa speak Neo-Aramaic as their first language; however, Arabic is their second language and is used in their schools. Tesqopa used to be famous for its pottery and used to be the main source for providing it to Mosul and its surroundings. Unfortunately, this industry ended after Tesqopa children moved into more modern jobs. Aside from pottery, farming and raising cattle have always been the main source of income for the people of Tesqopa. 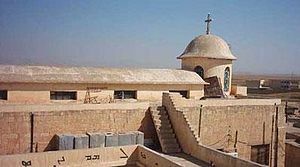 Tesqopa has two churches: Mar Yacob's (St. Jacob's) Church, which was built during the 13th century and Mar Gewargis's (St. George's) Church, rebuilt in 1955. The most important archeological remains in Tesqopa are those east of town where Dayra d'Mar Aprim (St. Ephrem's Monastery) used to be. Currently, its location is used as the village's cemetery. Mar Aprim, who built this monastery, was a monk who lived during the tenth century. This monastery was rebuilt in 1403 with money from the people of Tel Keppe. In the churches of Tesqopa are over 26 historical Syriac inscriptions. The oldest among them is dated 1698. Also, in the Museum of Berlin are kept three inscriptions written in Tesqopa during the 19th century. Moreover, in 1988 next to the hill of Tesqopa, the people of Tesqopa found a very old cave with some human remains and tools. An expedition was sent by the Iraqi government to explore the site; however, they did not publicize their findings. In Tesqopa there is a Pre-school, two elementary schools (one for boys and one for girls), and a middle-high school. These schools provide the required education for students between the ages of 4 and 18. ↑ Wilmshurst, David : The ecclesiastical organisation of the Church of the East, 1318-1913. Corpus Scriptorum Christianorum Orientalium, Vol. 582, Subsidia 104. Leuven: Peeters, 2000. pages 234-236. ↑ استشهاد أكثر من خمس وعشرين شخصا في انفجار تللسقف. Zahrira (in Arabic). 23 April 2012. Retrieved 11 April 2012.